t’s always such a relief when the weather begins to cool down after the summer. It means that fall is finally in the air. But with the cooler days, I always end up craving comfort foods. Of course, there are the typical comfort foods like lasagna, chicken noodle soup and roast chicken. But one of my favorite comfort foods is fettuccini alfredo. The rich, creamy alfredo sauce that coats the tender noodles is just amazing. There is nothing quite like it. It just tastes like comfort. Traditional alfredo is made with heavy whipping cream, butter and lots of cheese. None of those things really fit with Weight Watchers. Sure, I could just have a little tiny portion and still use up a lot of my Points, but I thought I’d try and lighten up the recipe instead. Of course, I swapped the heavy whipping cream for fat free half and half, but you must keep the butter and Parmesan cheese, or you don’t keep the flavor. Switching the heavy cream for a lighter, fat free alternative, is a great way to start, however. It means that you don’t sacrifice the flavor while you sacrifice the calories and fat (and Points)! The other major change that I made was to swap out the regular pasta for the Miracle Noodle Fettuccini noodles. If you haven’t heard of these noodles or haven’t tried them yet – try them. They are delicious, and they are a great option to lower the calories in your favorite pasta dishes. Miracle Noodles are Shirataki noodles. These noodles are a traditional Japanese noodle that is made from the konjac plant. The noodles are primarily water and a little bit of glucomannan, which is a form of dietary fiber that is water soluble. This makes them very low in calories and carbohydrates. And don’t think that just because they’re low in calories and carbohydrates that they’re low in flavor too. While they might not be the best choice to eat plain with butter, they’re perfect in all your favorite pasta dishes. Don’t believe me? Well, I’ll put it this way for you – even my (picky) husband loves them. If that isn’t an endorsement, I don’t know what is. The final change that I made to my favorite of comfort foods was the pumpkin. I normally don’t care all that much for pumpkin, and especially not for pumpkin flavored drinks and foods, but this was an exception. I had a can of pumpkin puree on hand that I wanted to use up. Pumpkin is loaded with fiber, vitamins and minerals, so I thought that adding it to my alfredo might be a good way to give the alfredo a healthy boost. Plus, it adds a nice seasonal flair. All in all, I made one of my favorite comfort foods a healthy Weight Watcher friendly recipe without sacrificing any flavor! This dish ended up creamy and rich but still easy to prepare and easy on the points. 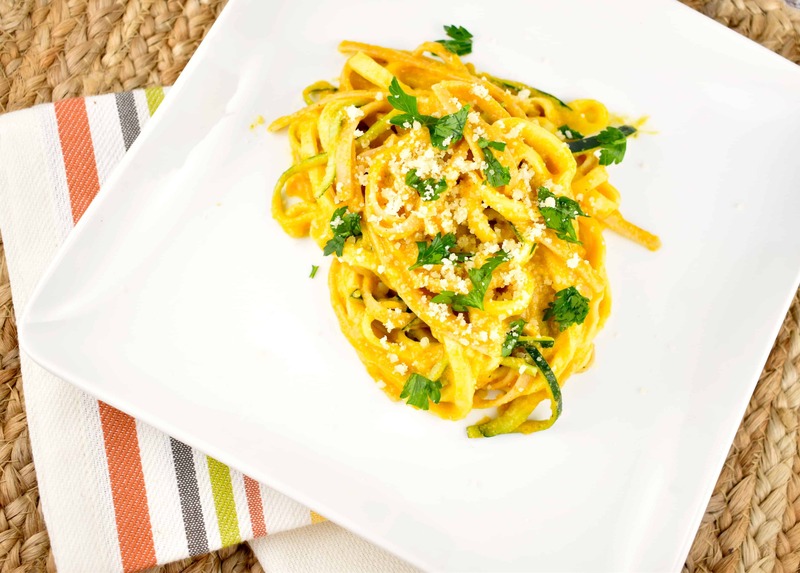 Indulge in your comfort food cravings with some Pumpkin Alfredo without indulging in the guilt! WANT MORE PUMPKIN RECIPES? CHECK THESE OUT! A rich, creamy, and lighter alfredo recipe, with the seasonal flavor of pure pumpkin. Drain all Miracle Noodles from package and rinse well. Cook according to package directions, drain, and set aside. In a large skillet, melt butter over medium-low heat. Stir in garlic and cook for about a minute, stirring regularly. Stir in remaining ingredients. Stir until sauce is heated through and cheese is melted. Add in Miracle Noodle and zucchini spirals, and cook over medium-high heat until pasta is evenly coated and zucchini is well heated; about 1-3 minutes. Divide into 4 bowls, garnish with fresh parsley and extra Parmesan, if desired.